Drew Pearson (pictured), 27, the son of BMH author James Pearson, was killed Monday in an auto accident in Florida. Drew Pearson’s father, James, is a Grace Seminary alumnus and is pastor of Brookside Community Church in Fort Wayne, IN. He is the author of Minefields in the Marketplace, a popular BMH book on biblical ethics in the business world. Here is an excerpt of an article from the Port Charlotte newspaper. To read the entire article, click here. NORTH PORT — After working 80 hours per week, teaching golf twice a week in Fort Myers, doing research for completing his master’s degree and not taking a day off as the general manager of Bobcat Trail for more than two years, Drew Pearson had a great reason to take a break and relax on Sunday. His wife, Emily, was having a C-section to deliver their first child at Cape Coral Hospital. But just hours after Pearson sent photos via cell phone to friends and family of his 5-pound, 8-ounce baby girl, Peyton McKenzie, the 27-year-old was killed Monday morning when his 2003 Buick SUV collided with a dump truck hauling sand on Interstate 75. Pearson had been returning to his Port Charlotte home from the hospital around 10 a.m. The wreck occurred just a few miles from their house. Some tried to play golf at Bobcat Trail Golf Club in North Port on Tuesday morning in between hugging, crying and talking about the man who most believe was the “heart and soul” of the 500-plus-resident community off Toledo Blade Boulevard. “(Drew) was Roger (Delagrange’s) protegee,” Glenke said of Pearson coming to work for Delagrange as the general manager of Bobcat Trail when he was 23 years old, eventually turning the golf course into one that Golf Digest ranked 4.5 out of 5 stars. 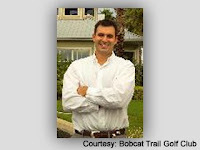 “Through Drew’s dedication, he made Bobcat Trail one of the best golf courses in Southwest Florida.” . . .
. . . Before his death, Pearson’s mother, Linda, flew in from Indiana to spend time with the couple and to “spoil the new grandbaby.” His father, a pastor in Indiana, and his brother, Kyle, were driving to Florida when they received the terrible news. Linda and Jim Pearson spent time Tuesday at the hospital with their daughter-in-law and newborn granddaughter. Linda said that Emily, who is younger than Drew, liked him even before she graduated from high school and he was in college. The pair began dating while attending Taylor University in Indiana. They were married by Pearson’s dad in May 2006. I do not personally know this young man, new father and young husband, but my heart goes out to his wife and family for their loss. Knowing he is with the Lord is always comforting and the hope of seeing him again in glory, but losing a loved one is never easy. I knew Drew when he was a teenager, his father was the pastor at Bethel Ev Free in Fargo, ND when my family moved to the area. Pastor Jim was a great pastor, but I remember Drew, he was a handsome, kind, funny and amzing guy who helped me to feel very welcome to the youth group when I was new and scared in a big new church. My prayers and sorrow to the family, and my joy that we will see him again in Heaven. Would we all leave a legasy like this when we die. In some ways he will live on because of His faithfulness to God in how he lived his life. I didn't know him but wish I had. I don't know this young man, yet know his mother, Linda, who is the principal at Lakewood Park Christian School. My heart and prayers go out to this wonderful family, who know and trust our living God. What a wonderful reunion you know you will have one day. But for now, will pray for you every day as you miss Drew, and find comfort in Christ as He surrounds you with loving friends and family.